Labour Bureau, Government of India has released the All India Consumer Price Index for Industrial Workers (AICPI-IW) for April 2015. As against the flat and reducing Trend CPI-IW in the recent past, the index has increased by 2 points and moved from 254 to 256. Readers must be aware GConnect had in the month of April 2015 estimated DA from July 2015 applicable to Central Government Employees and Pensioners as ranging from 117% to 119% (4% to 6% increase in DA from July 2015) with eight Actual CPI-IW values from April 2014 to Feb-2015 and four estimated CPI-IW values from March 2015 to June 2015. Scenario IV : More Inflationary Trend. As we have two more Actual CPI-IW values for the months of March 2015 and April 2015, it woud be easier to estimate DA from July 2015 more accurately for these Sceenarios with 10 actual CPI-IW values and two estimated values for May 2015 and June 2015. Scenario II and IV can be negated straightaway with following observations in respect of those possibilities. (i) Scenario II in which DA of 117% predicted will not be possible as Flat Consumer Price Index trend has changed with increase of one and two point in the month of March 2015 and April 2015 respectively. (ii) Scenario IV in which DA of 120 % was discussed is also not possible as it would require 4 point increase and 3 point increase in CPI in the months of May 2015 and June 2015 respectively. Then which Scenario will come to reality ? Scenario I ? or Scenario III ? 1. DA from July 2015 will be 119% (Scenario III) is possible even with one point decrease each in the month of May 2015 and June 2015 viz., CPI-IW of 255 and 254 in the months of May 2015 and June 2015 respectively. 2. 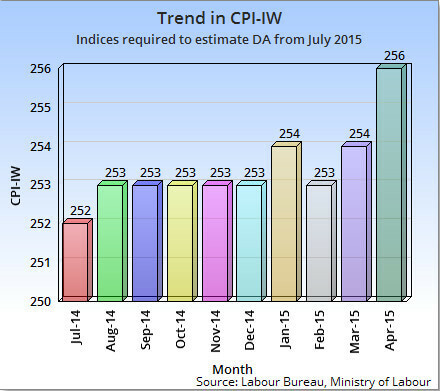 DA from July 2015 will be 118% only if CPI-IW decreases to 254 in the months of May 2015 and June 2015. 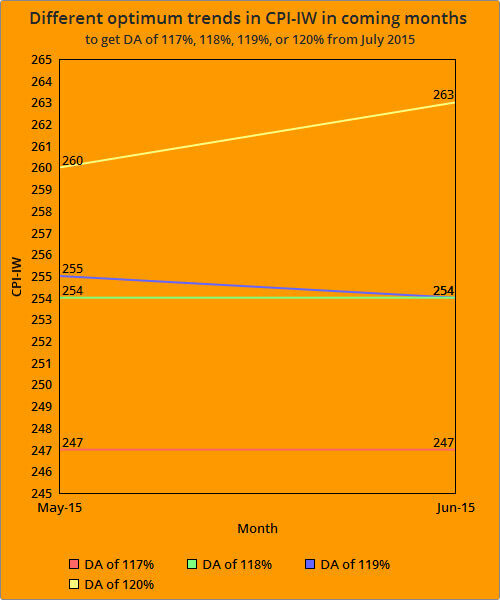 The All-India CPI-1W for April, 2015 increased by 2 points and pegged at 256 (two hundred and fifty six). On 1-month percentage change, it increased by 0.79 per cent between March, 2015 and April, 2015 when compared with the increase of (+) 1.26 per cent between the same two months a year ago. The maximum upward pressure to the change in current index came from Food group contributing (+) 1.24 percentage points to the total change. At item level, Rice, Arhar Dal, Gram Dal, Urd Dal, Fish Fresh, Goat Meat, Poultry (Chicken), Milk (Buffalo & Cow), Vegetable & Fruit items, Tea (Readymade), Snack (Sweet Saltish), Country Liquor, Electricity Charges, Doctor’s Fee, Private Tuition Fee, Tailoring Charges, etc. are responsible for the increase in index. However, this increase was restricted by Eggs (Hen), Onion, Chillies Green, Sugar, Petrol, Flower/F lower Garlands, etc., putting downward pressure on the index. The year-on-year inflation measured by monthly CPI-1W stood at 5.79 per cent for April, 2015 as compared to 6.28 per cent for the previous month and 7.08 per cent during the corresponding month of the previous year. Similarly, the Food inflation stood at 5.68 per cent against 6.98 per cent of the previous month and 7.76 per cent during the corresponding month of the previous year. At centre level, Srinagar reported the highest increase of 9 points followed by Bhilai (5 points). Among others, 4 points increase was observed in 14 centres, 3 points in 9 centres, 2 points in 14 centres and I point in 18 centres. On the contrary, Giridih centre recorded a maximum decrease of 6 points followed by Guntur (3 points) and Ranchi-Hatia and Godavarikhani (2 points each). Among others, 1 point decrease was observed in 8 centres. Rest of the 9 centres’ indices remained stationary. The next index of CPHW for the month of May, 2015 will be released on Tuesday, 30th June, 2015. The same will also be available on the office website www.labourbureau. gov. in.